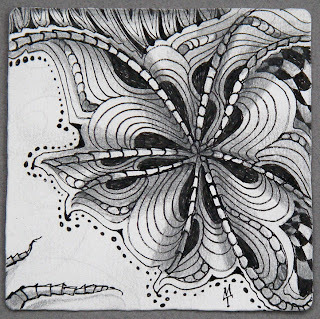 Laura Harms' weekly challenge #6 is to create a Zentangle using ixorus. Here are two contributions from Maria. We were looking at some other contributions to Challenge #6 and when we saw Carole Ohl's, the similarity of this one to Maria's just above made us want to cue up the theme from Twilight Zone! Thanks again, Laura, for this fun series. It's all so much fun. Yeah! Love the loops to tie up the ends of the braces of IXORUS. I think I saw them somewhere else in this challenge – but where??? 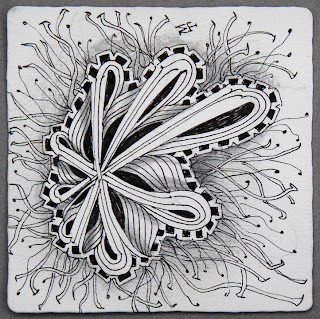 Very stunning variations of this tanglation on Planet Zentangle :o) . Another case of great minds think alike! Working with Ixorus is generating some delightful variations and interpretations. 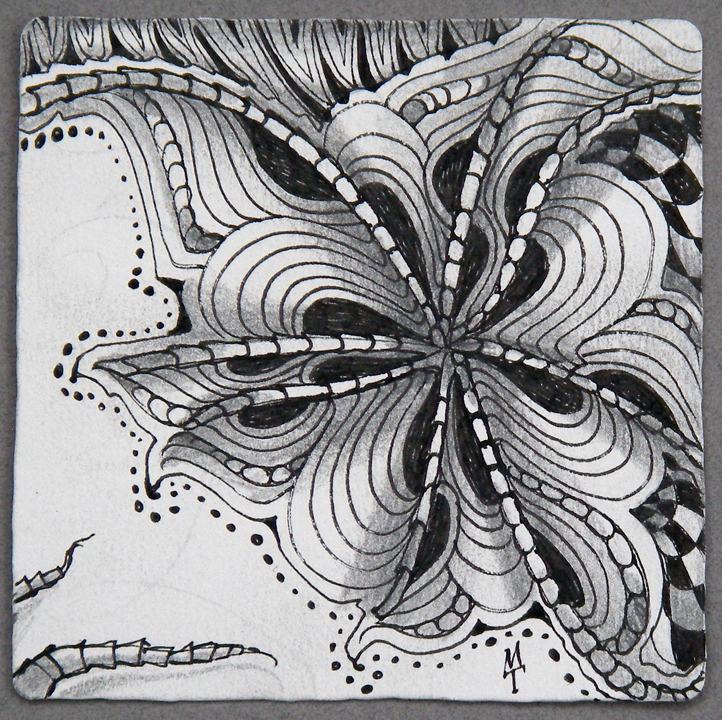 The joy of zentangle unfolds once again with each new tangle and seems to be a never ending adventure! That is strange how they look so much alike! Usually, it is always so amazing how everyone's look so different. All of them are beautiful! 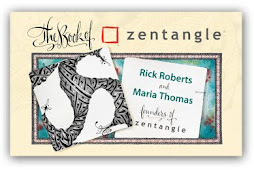 Thanks for the fun new tangle, Rick & Maria! 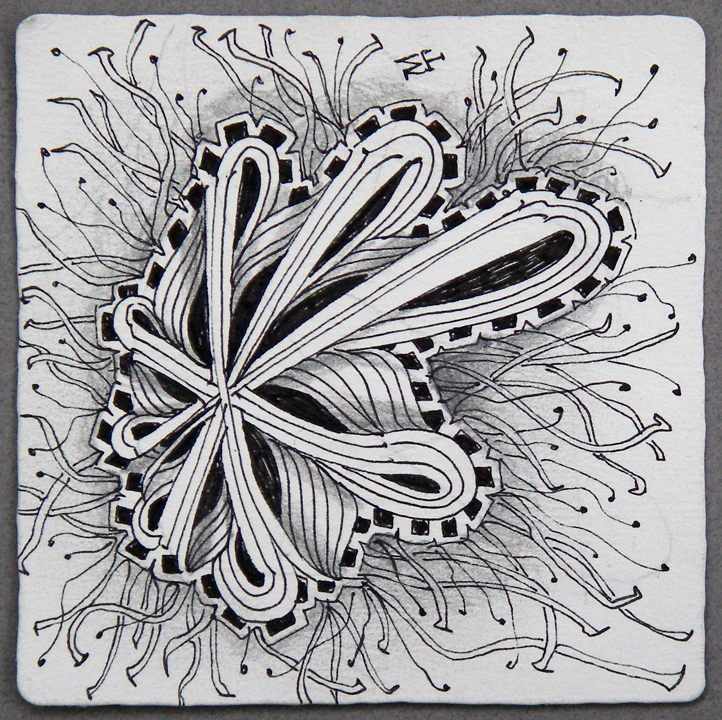 When I first found you at zentangle.com I fell in love. There is a reason that you are so loved by zentanglers....your work is exquisite! You have a talent for style, contrast, and design. I also love your lettering abilities (callegraphy)! Your work is amazing and the similarities, yes... Twilight Zone... or is it dejatangelation?? I'm giggling at 'dejatangelation' now too...that should be our next challenge LOL. Lovely tiles! gorgeous work on this complex tangle "ixorus" which looks so good reigning the premier plan(foreground).incredible relation between yours and Carol's tile! My first thought when I saw ixorus was "squid". So mine, too, will be similar to the others. I start the challenge on Monday, but never quite finish. I plan to finish while I wait for my car to be inspected, etc. at the shop today... Love the wonderful variations people are coming up with. This challenge is a great example to use in classes to challenge new students to take any pattern and change it up, or "tangleate it."